On May 14, 2016 the National Association of Letter Carriers (NALC) held its 24th Annual Food Drive. 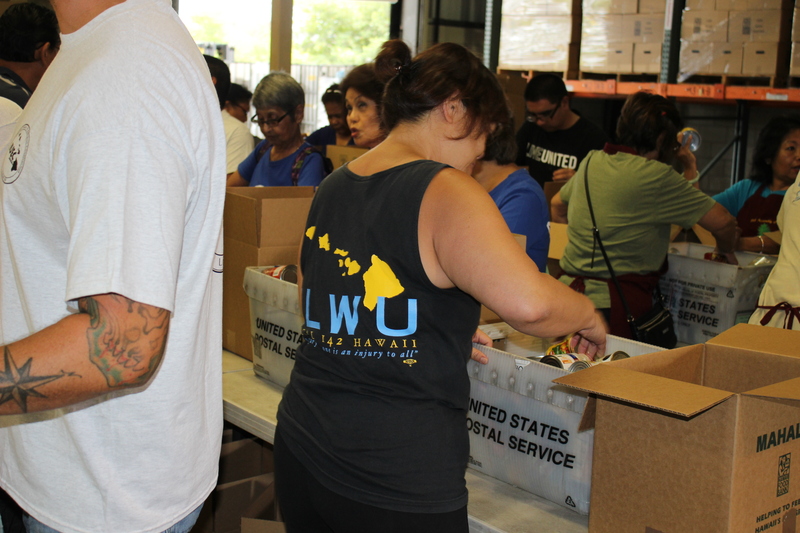 The letter carriers picked up a variety of non-perishable food items left in or next to mailboxes on their routes and brought them back to the Hawaii Foodbank. Volunteers from the community, including HOWU members, ILWU members from Unit 4524 – Airport Honolulu Hotel and ILWU staff helped to sort the donated food items. 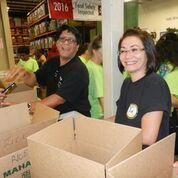 Warmest thanks to all volunteers for their hard work and outstanding contribution to the NALC Food Drive. Unit 4524 – Airport Honolulu Hotel: Larry Yadao, Timothy Manago, and Jeanne Soares. HOWU member: Secretary Sui Ling Poy. 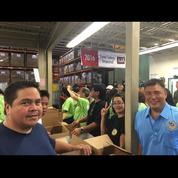 ILWU Business Agents: Dillon Hullinger, Wilfred Chang, Jr., Paris Fernandes, and Division Representative Jose Miramontes, Jr.
HOWU member Sui Ling Poy helped to sort donated food item. Timothy Manago and Jeanne Soares. Oahu Division Business Agent Dillon Hullinger, Unit 4524 – Airport Honolulu Hotel members, Larry Yadao, Timothy Manago, and Jeanne Soares. Honolulu Hotel: Larry Yadao, Timothy Manago, and Jeanne Soares. Division Representative Jose Miramontes, Jr. and Business Agent Wilfred Chang, Jr. Tentative agreement reached April 25, 2016. Contract ratified May 5, 2016. Tentative agreement reached April 12, 2016. Contract ratified May 4, 2016. First contract ratified April 29, 2016. Ratified contract on April 26, 2016. Ratified contract on April 21, 2016. January 30, 2016 at the Nani Mau Gardens. Settled a first contract for employees of the engineer department on January 12, 2016. Contract ratified on January 25, 2016. Tentative agreement reached November 5, 2015. Contract ratified on January 14, 2016. Contract ratified on December 1, 2015. Tentative agreement reached November 19, 2015. Tentative agreement reached November 13, 2015. Tentative agreement reached November 6, 2015. Tentative Agreement reached with Young Brothers, Ltd. Tentative agreement reached on October 19, 2015. Contract ratified on October 30, 2015.